Civil Aviation and Tourism Minister Rashed Khan Menon on Wednesday said trade bodies have to come forward to assist the authority for infrastructure development in the airport for smooth shipment. 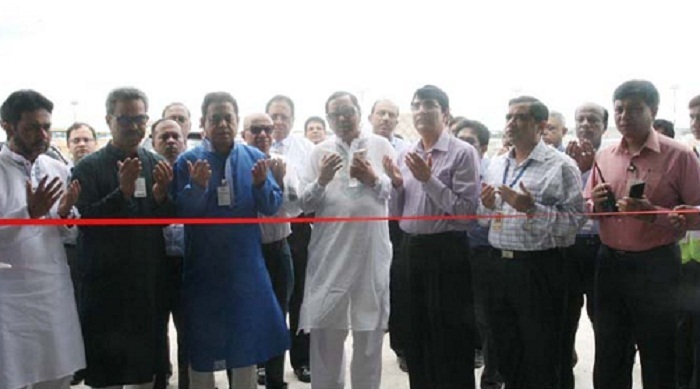 The minister made the call after inaugurating a newly built cargo shade in Hazrat Shahjalal International Airport (HSIA) in the city, BSS reports. "There is no alternative of export-import towards the development of country and a big chunk of the export-import is being conducted through the airport. So, the trade bodies could help the government in developing infrastructure at airport for timely shipment of goods," he added. The new cargo shade has been constructed at the airport with the cooperation of Bangladesh Garments Manufacturers and Exporters Association (BGMEA), said a ministry press release. Speaking on the occasion, BGMEA President M Siddiqur Rahman said the new cargo shade would facilitate the export-import operation in the airport. Civil Aviation and Tourism Secretary S M Golam Faruk, Civil Aviation Chairman Air Vice Marshal Ehsanul Goni Chowdhury, Additional Secretary Abul Hasnat Ziaul Huq, Biman Managing Director Mosaddik Ahmed, Member (Operation) Civil Aviation Mostafizur Rahman and Airport Director Zakir Hossain, among others, were present.